About 3.5 years ago, I featured a sketched art print of the Mukilteo Lighthouse, which was just the lighthouse structure itself. I had also sketched a different perspective of the compound that I did not include in that post. I had almost forgotten about that particular viewpoint until I came across it the other day. The photograph it was based on was taken as the ferry from Whidbey island, Washington was docking at Mukilteo (Mukilteo is north of Seattle and south of Everett). The structures look like little doll houses and you actually have all three structures in this print. The two little “homes” actually flag the small lighthouse. I really liked the perspective of this composition and the sketching technique as it creates a rustic and romantic look. The lighthouse is a working lighthouse with the ferry dock right next door and sits on Possession Sound. The structure was opened in 1906 and for more information on Wikipedia, click here. 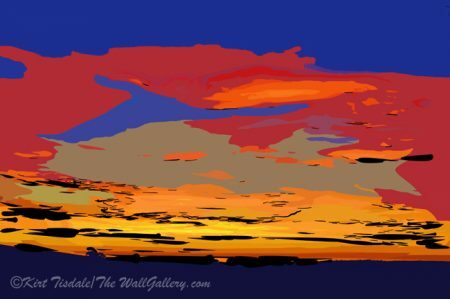 This entry was posted in Art Prints and tagged art gallery, artist kirt tisdale, interior design, mukilteo lighthouse, online art gallery, pacific northwest, seattle, sketches on January 5, 2019 by Kirt D Tisdale. 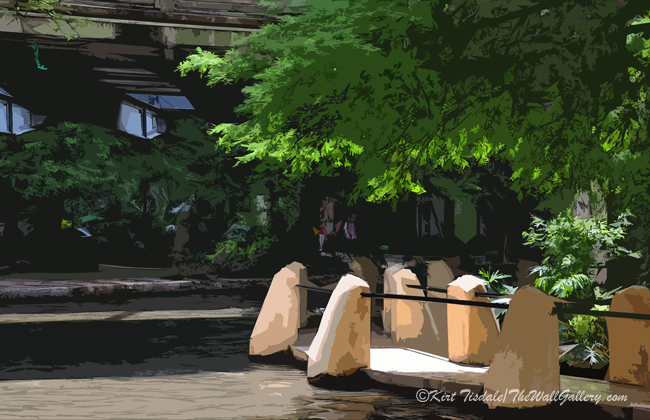 I’m featuring four art prints this week that I created from a photo shoot I did a couple of years ago from a visit my wife and I took to San Antonio. I hadn’t been to the River Walk since I was a young adult and my wife had never been. We had business in Austin and since the two cities are only about an hour and a half apart, we took a day for me to introduce her to the infamous River Walk. From that shoot, I used a two different watercolor techniques to soften up the images. 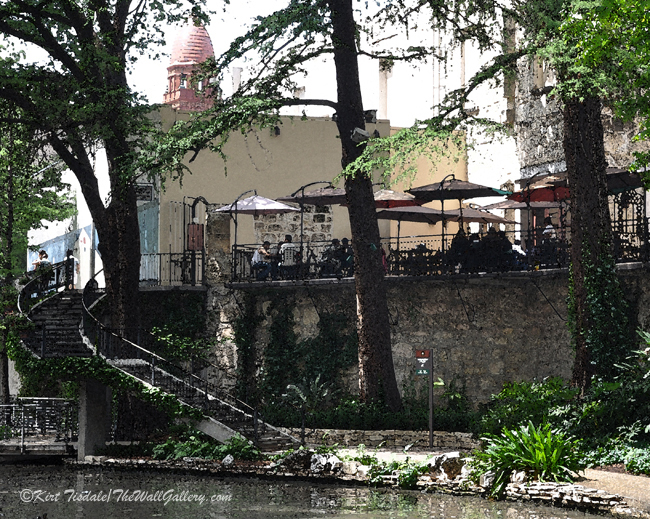 For those of you who have not had the pleasure of visiting the River Walk, it is along the San Antonio River in downtown San Antonio. It sits about one story below street level and winds throughout the downtown area. When you descend onto the River Walk, it feels like you have just entered another world. The hustle and bustle of street traffic disappears to the quiet of a peaceful river walk lined with restaurants and shops. The first two pictures I created using a slightly abstract watercolor technique that creates small abstract shapes to “paint” the picture. They give you a better perspective of the walkway as it winds along both sides of the river. 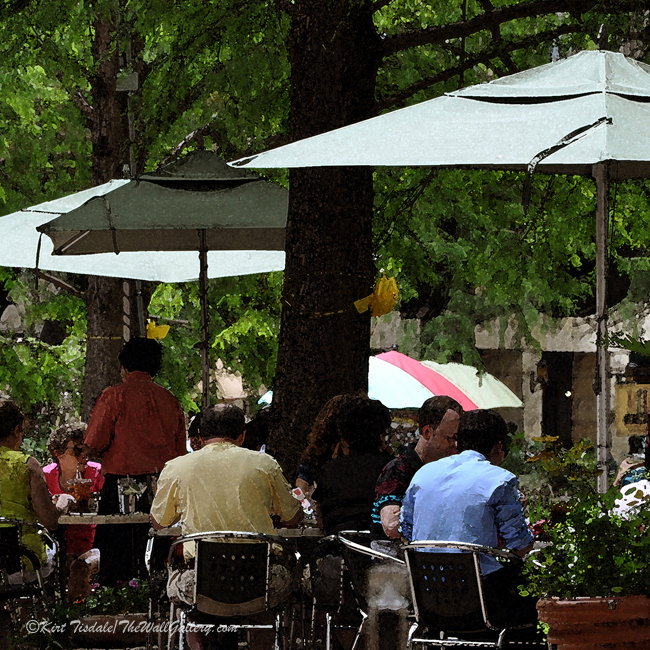 Love the trees as they shade all of the outdoor cafes. The last two pictures, I used a more traditional watercolor technique giving you a view of two different outdoor cafes. 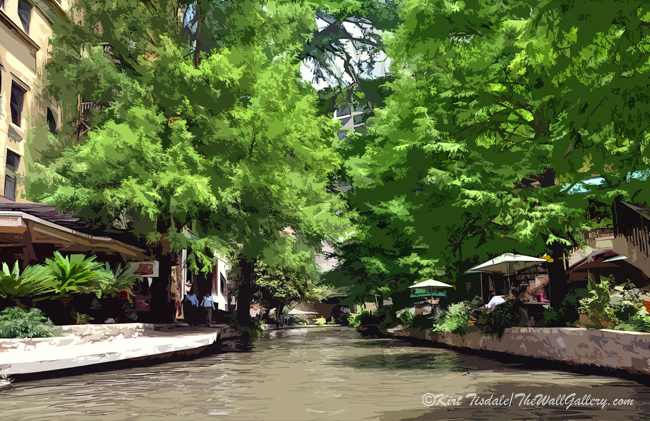 This entry was posted in Art Prints, Landscapes: Watercolor, Watercolor Painting and tagged art gallery, artist kirt tisdale, online art gallery, san antonio, san antonio river walk, texas on September 21, 2018 by Kirt D Tisdale. With Thanksgiving this Thursday in the United States it marks a time for me to reflect back on the year and really take in all those things that have blessed my life. We all have our stories, issues, setbacks and concerns, but for me I like to take the time to rest (mentally), contemplate and be thankful. That may be a brief second, a few minutes or a quiet place with a leisurely glass of wine. Whatever that place and time is, when I see this print, this is the type of place I think of. 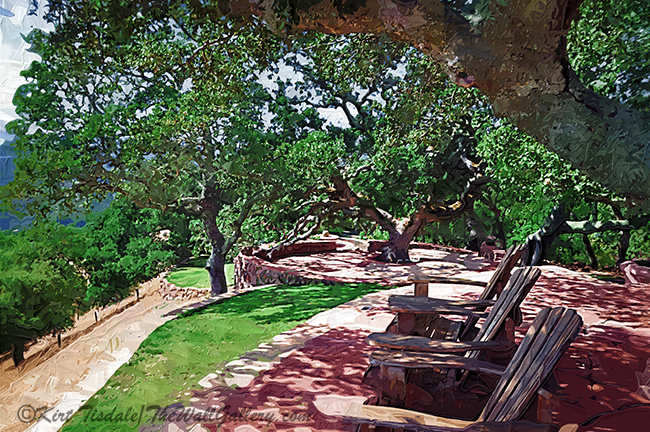 What could be more inviting then sitting in one of these Adirondack chairs, gazing out over a valley under a big old oak tree. May your Holiday Season be filled with Peace and Joy, may you enjoy family and friends. For these things, I am most thankful. This entry was posted in Landscapes: Oil and tagged art gallery, artist kirt tisdale, interior design, landscape, napa valley, northern califonia, online art gallery, overlook, thanksgiving on November 20, 2017 by Kirt D Tisdale. “End of Day at The Dock” is an art print I created using a traditional watercolor technique. This technique focuses on traditional colors and shading to create a soft warm print. The setting is Victoria Harbour, British Columbia. The harbour is used as a seaport for aviation as well as for boats including ferry service, fishing and sail boating. This particular scene is directly in front of the Fairmont Empress Hotel, famous for it’s afternoon tea and Victorian ambiance. What I like about this print is three-fold. I love the overall softness of colors, they create a warm comforting visual experience. 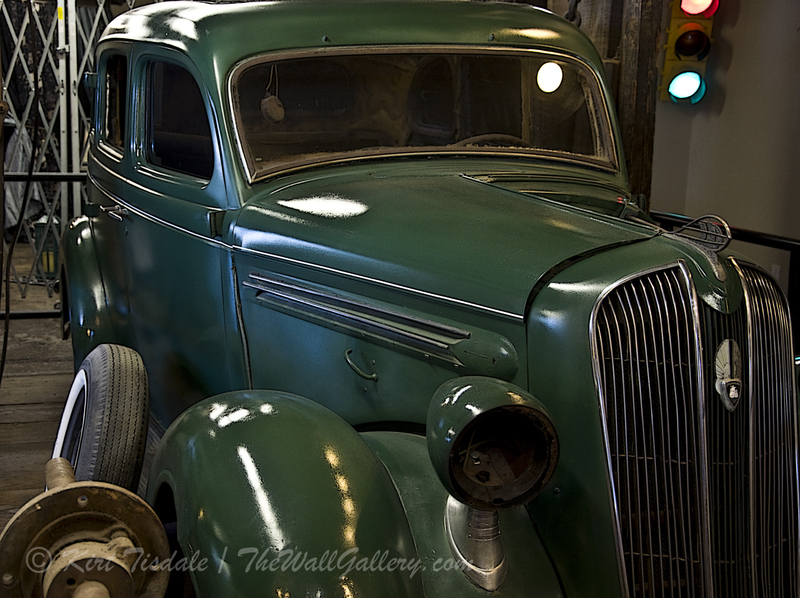 The other aspect I like is the subject matter. There is something visually appealing about boats docked in a harbor (or harbour in this case) right after sunset when dusk settles in. The third aspect is the two visual focal points created by the lights on the dock by the boats. These focal points pull your eye in to see more detail. Thoughts? 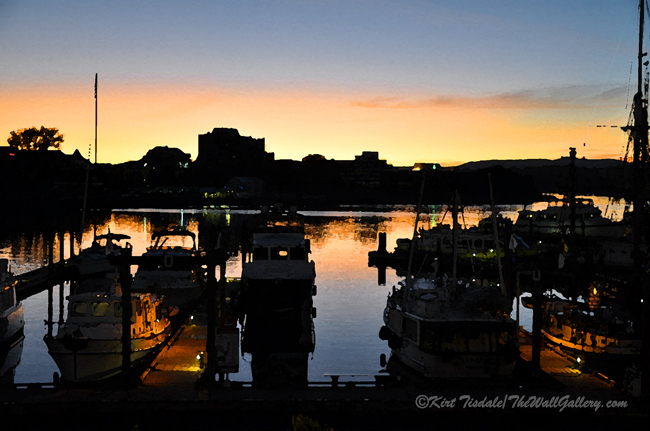 This entry was posted in Art Prints, Landscapes: Watercolor and tagged art gallery, artist kirt tisdale, boats, british columbia, interior design, nautical, online art gallery, victoria harbour, watercolor art on October 9, 2017 by Kirt D Tisdale. I was looking for an end of summer art print to feature this week since we have now officially entered autumn. I wanted something different from just the obvious autumn colors when Boat Dock On North Lake spoke to me as just the one. 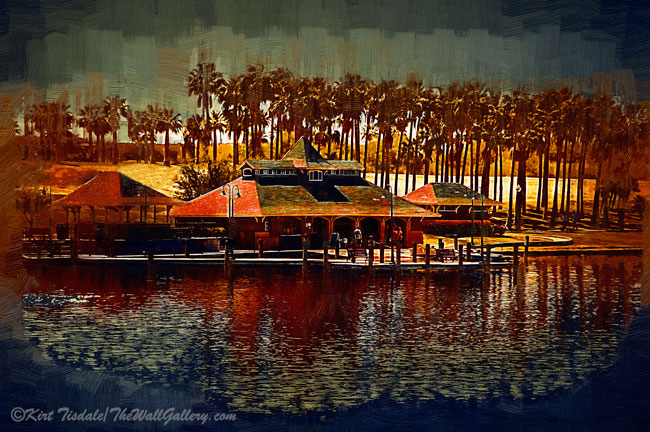 I realize it has palm trees and is a tropical setting, but with the subdued style I used to create it, the color tone sets the mood of those waning summers days. Summer speaks of bright sunlight and vibrant colors. Autumn speaks of more earth tones and less activity. The subject matter creates a scene that would be busy with people and boats during the summer peak months. Now the boat dock is quiet and looks closed down for the season. My point being that color tones set a mood and a look for any given art print. Thoughts? This entry was posted in Landscapes: Oil and tagged art gallery, art print, artist kirt tisdale, boat dock, interior design, nautical, online art gallery on September 25, 2017 by Kirt D Tisdale. 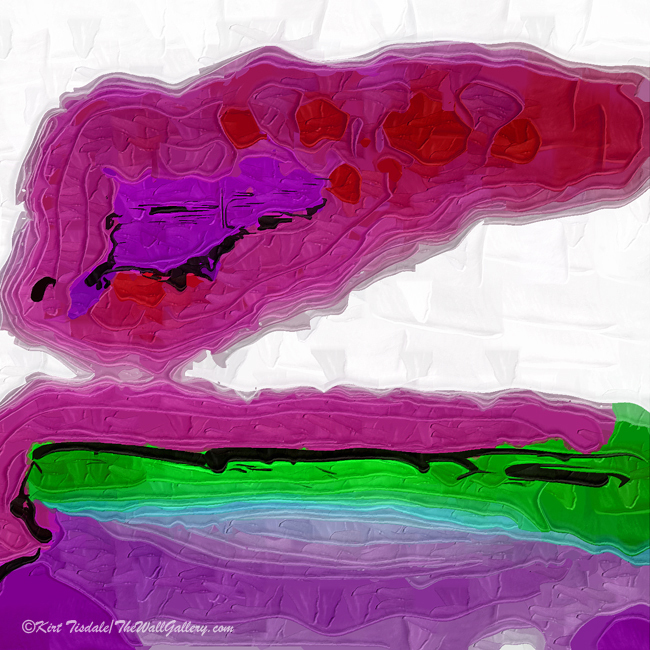 This week I wanted to feature one of my abstract prints. This particular print reminds me of frozen sherbert, especially the colors. Growing up in the midwest (Iowa), ice cream was the dessert of choice and for whatever reason I just didn’t care for it. On a visit to my grandparents house one year, I was introduced to frozen sherbert (the days before Sorbet was readily available). I love the rainbow variety and the different fruit flavors. Something about the consistency and vibrant colors appealed to me and I was converted. To this day, I’m still not an ice cream person, but love a good sorbet. That is how the title came to fruition and the next question should be…”I get that abstract art can be very esoteric, but what in the world are these shapes and colors based on?” Great question and the answer will probably surprise you. This print was created from a photograph taken of the sun setting over a very foggy ocean. My wife and I were traveling up the Northern California coastline and had stopped for the night. A very thick layer of fog was rolling in just as the sun was going down. The scene went from where you could hardly see the water or the waves breaking to a bright spot of light and massive color display in the fog reflected off of the water to hardly seeing the ocean again. From the picture, I worked with this particular technique (Impasto…bold brush strokes) and chose this color palette until I had what I was envisioning for an abstract print. Thoughts? 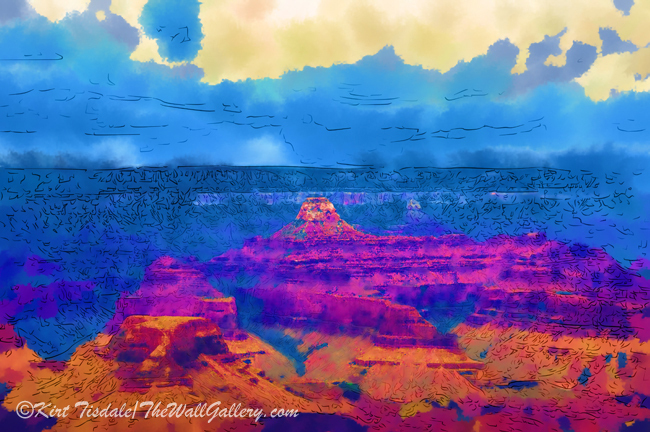 This entry was posted in Abstract Oil, Art Prints and tagged Abstract art, abstract art prints, art, art gallery, artist kirt tisdale, interior design, online art gallery on May 22, 2017 by Kirt D Tisdale. 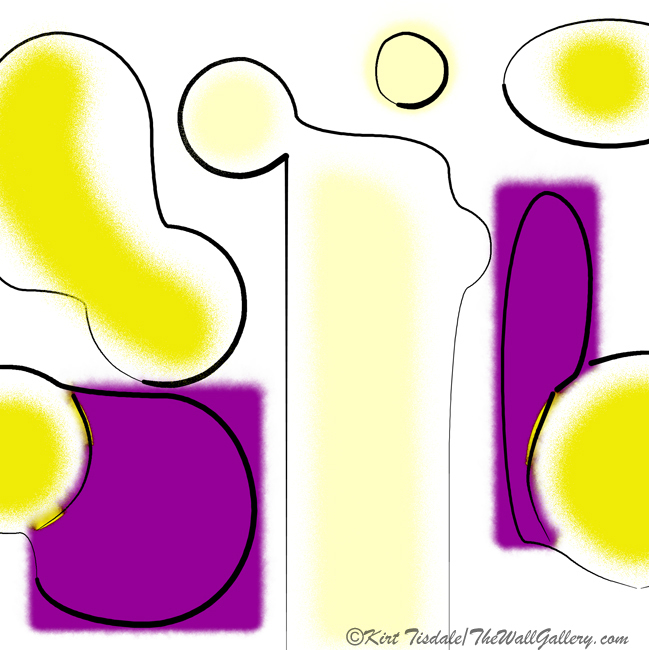 “Yellow and Purple” This particular print is an abstract expression that I had fun creating by drawing the shapes and creating the colors in a very simplistic style. Both were created using a digital free hand drawing and painting technique. I think the end result presents a fun, colorful and clean contemporary design. Thoughts? This entry was posted in Abstract Watercolors, Art Prints and tagged abstract art prints, art gallery, art prints, artist kirt tisdale, interior design, online art gallery, watercolor art on January 4, 2017 by Kirt D Tisdale.